Whether he’s diving to the bottom of the Marianas Trench, building the Brooklyn Bridge, or racing with the speed of light to the farthest reaches of the universe, Isaac Asimov excites our intellect. In this remarkable new collection, he takes us on a fantastic journey back 4.5 billion years, calculates the Day 1, and looks for the runaway asteroid that killed the dinosaurs. Along the way he teaches us to avoid the “bends,” and to hunt for quarks. 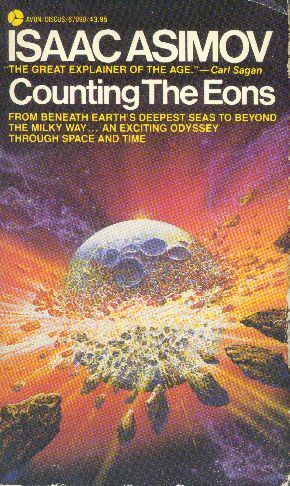 From robots to Einstein, black holes to anti-matter, COUNTING THE EONS is an entertaining mix of Asimov’s scientific wit and wonder. *And that glittering diamond? In just an eon or two, it will revert to a more stable form of carbon—graphite. While continuing in the solid tradition of the F&SF essay collections, this one does have a couple of points that make it stand out. Not least of these is the essay “The Word I Invented”—the word being, of course, robotics. What follows is a fairly concise and reasonably complete rumination by Asimov on what he was really trying to accomplish when he wrote his influential robot stories. Most of the other essays in the collection are not, perhaps, quite as outstanding, but many are reasonably close, essays like “After Many a Summer Dies the Proton” which catch the reader up on some aspects of current scientific development which aren’t as thoroughly covered in Asimov’s other books are are earlier discoveries or theories. And essays like “Let Me Count the Days” are just plain fun.